Eucalyptus, imported from Australia, soon gave the shade of its cool, healthful foliage where previously no trees had grown. In the course of time dry farming (which some people consider a recent discovery, but which in reality is as old as the Old Testament) was introduced and extended with American agricultural implements; blooded cattle were imported, and poultry-raising on a large scale was undertaken with the aid of incubators--to the disgust of the Arabs, who look on such usurpation of the hen's functions as against nature and sinful. Our people replaced the wretched native trails with good roads, bordered by hedges of thorny acacia which, in season, were covered with downy little yellow blossoms that smelled sweeter than honey when the sun was on them. More important than all these, a communistic village government was established, in which both sexes enjoyed equal rights, including that of suffrage--strange as this may seem to persons who (when they think of the matter at all) form vague conceptions of all the women-folk of Palestine as shut up in harems. A short experience with Turkish courts and Turkish justice taught our people that they would have to establish a legal system of their own; two collaborating judges were therefore appointed--one to interpret the Mosaic law, another to temper it with modern jurisprudence. All Jewish disputes were settled by this court. Its effectiveness may be judged by the fact that the Arabs, weary of Turkish venality,--as open and shameless as anywhere in the world,--began in increasing numbers to bring their difficulties to our tribunal. Jews are law-abiding people, and life in those Palestine colonies tended to bring out the fraternal qualities of our race; but it is interesting to note that in over thirty years not one Jewish criminal case was reported from forty-five villages. 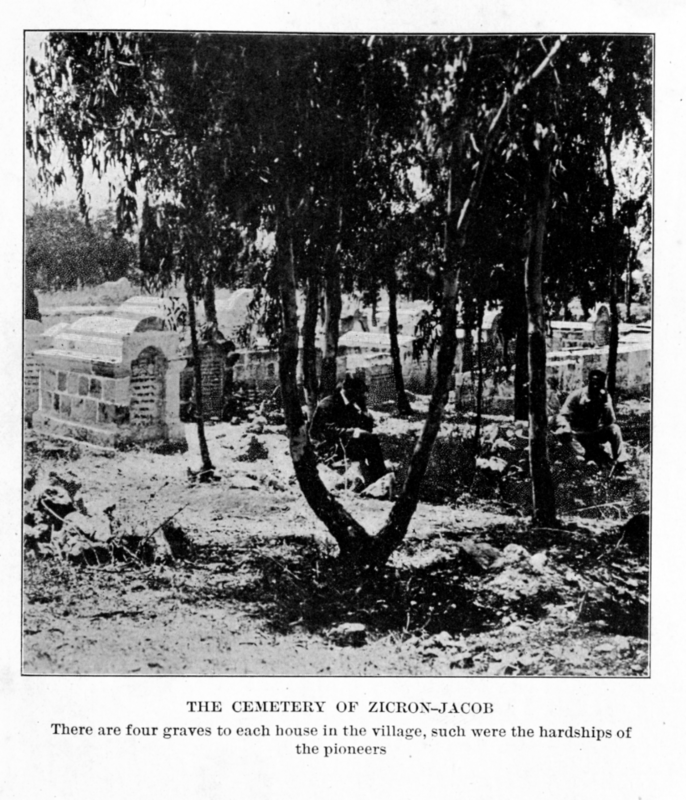 Zicron-Jacob was a little town of one hundred and thirty "fires"--so we call it--when, in 1910, on the advice of my elder brother, who was head of the Jewish Experiment Station at Athlit, an ancient town of the Crusaders, I left for America to enter the service of the United States in the Department of Agriculture. A few days after reaching this country I took out my first naturalization papers and proceeded to Washington, where I became part of that great government service whose beneficent activity is too little known by Americans. Here I remained until June, 1913, when I returned to Palestine with the object of taking motion-pictures and stereopticon views. These I intended to use in a lecturing tour for spreading the Zionist propaganda in the United States. During the years of my residence in America, I was able to appreciate and judge in their right value the beauty and inspiration of the life which my people led in the Holy Land. From a distance, too, I saw better the need for organization among our communities, and I determined to build up a fraternal union of the young Jewish men all over the country. Two months after my return from America, an event occurred which gave impetus to these projects. The physician of our village, an old man who had devoted his entire life to serving and healing the people of Palestine, without distinction of race or religion, was driving home one evening in his carriage from a neighboring settlement. With him was a young girl of sixteen. In a deserted place they were set upon by four armed Arabs, who beat the old man to unconsciousness as he tried, in vain, to defend the girl from the terrible fate which awaited her. Night came on. Alarmed by the absence of the physician, we young men rode out in search of him. We finally discovered what had happened; and then and there, in the serene moonlight of that Eastern night, with tragedy close at hand, I made my comrades take oath on the honor of their sisters to organize themselves into a strong society for the defense of the life and honor of our villagers and of our people at large. These details are, perhaps, useful for the better understanding of the disturbances that came thick and fast when in August, 1914, the war-madness broke out among the nations of Europe. The repercussion was at once felt even in our remote corner of the earth. Soon after the German invasion of Belgium the Turkish army was mobilized and all citizens of the Empire between nineteen and forty-five years were called to the colors. As the Young Turk Constitution of 1909 provided that all Christians and Jews were equally liable to military service, our young men knew that they, too, would be called upon to make the common sacrifice. For the most part, they were not unwilling to sustain the Turkish Government. While the Constitution imposed on them the burden of militarism, it had brought with it the compensation of freedom of religion and equal rights; and we could not forget that for six hundred years Turkey has held her gates wide open to the Jews who fled from the Spanish Inquisition and similar ministrations of other civilized countries. Of course, we never dreamed that Turkey would do anything but remain neutral. If we had had any idea of the turn things were ultimately to take, we should have given a different greeting to the mouchtar, or sheriff, who came to our village with the list of mobilizable men to be called on for service. My own position was a curious one. I had every intention of completing the process of becoming an American citizen, which I had begun by taking out "first papers." In the eyes of the law, however, I was still a Turkish subject, with no claim to American protection. This was sneeringly pointed out to me by the American Consul at Haifa, who happens to be a German; so there was no other course but to surrender myself to the Turkish Government.